There are many good walks from the doorstep. The Farmhouse information folder gives good examples. There are plenty of woods close by including Huntly, Blackmuir, Hallyburton, Birkhill Estate, Tentsmuir, Dronley and Balkello woods. For Beach walks we head to Tentsmuir, The West Sands at St Andrews, Broughty Ferry Beach and further away but worth the drive Lunan Bay (cafe next to the car park), nr Inverkeillor. There are also may country parks nearby to walk in, Camperdown Park, Riverside Nature Park, Crombie Country Park and Monikie Country Park. We are not far from the Angus Glens with their stunning Loch and Hill scenery. The Hermitage at Dunkeld is a beautiful walk and there are some good pubs and places to eat in Dunkeld. If you are up that way you could make a visit to Loch of the Lowes Visitor Centre to see The Ospreys and other Wildlife. In Fife we have climbed the Lomond hills and had a lovely afternoon tea in Falkland and we have visited the Loch Leven Heritage Trail (only 30 minutes by car) for walks and cycles. Loch Levens larder or the RSPB Vane farm cafe are both good stops at Loch Leven. We have bike storage at the Farmhouse. There are some good routes around our area in The Carse of Gowrie, The Salmon run from Invergowrie to Errol being one of them with pleasant views and plenty of wildlife. There is also a good route from Longforgan, our local village to Kinfauns with many more scenic routes in the area. For more details look at cycle-route.com and search Perth and Kinross, Angus and Fife. 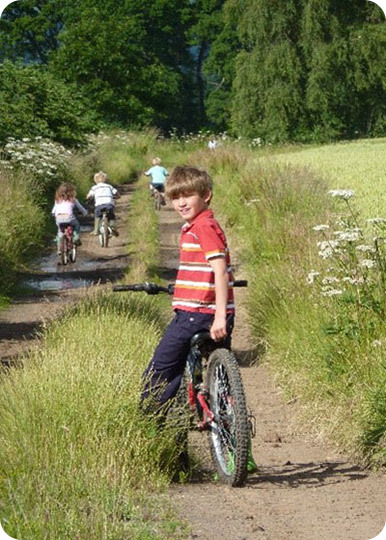 Only a few miles away we have Templeton woods which has a mountain bike skills trail and there are bits and pieces of natural trail within 30 miles of Dundee – the Sidlaws, Kinnoull Hill and Pitmedden are good examples. Tentsmuir is also good for family cycling. There is a lot of information online and in the Farmhouse if you want to plan some cycling. 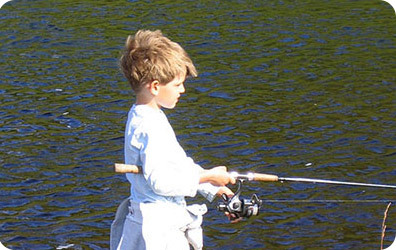 Water sports/fishing – There is a huge selection in Perthshire, Angus and Tayside. For water sports watersporty.co.uk is very helpful – Search Angus, Perthshire and Fife. 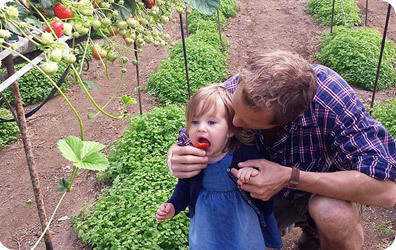 In the Summer months, crop permitting, guests that have booked Carmichael Farmhouse for a full week may have a chance to try picking strawberries or raspberries in tunnels. This is only available during week day afternoons after farm picking has finished. This cannot be guaranteed as it depends on the crop and other farm activities. If you are interested in picking please ask for information on arrival. There is a good choice of golf courses nearby and 3 championship courses, all within an hours drive, St Andrews, Carnoustie and Gleneagles. We are not serious golfers but have enjoyed family golf at Piperdam Golf Course. They have also got a putting green and driving range. For more information on golf refer to Scotland golf website. Isle of May boat trips – spot seals, puffins, dolphins. From Anstruther harbour, under an hour. 30 miles away. Mackerel Fishing – Kids had a go at this and loved it. Caught a boat from Arbroath Harbour, caught mackerel and cooked for their tea. For more info go to Arbroath Angling. We are only 30 minutes from Arbroath. 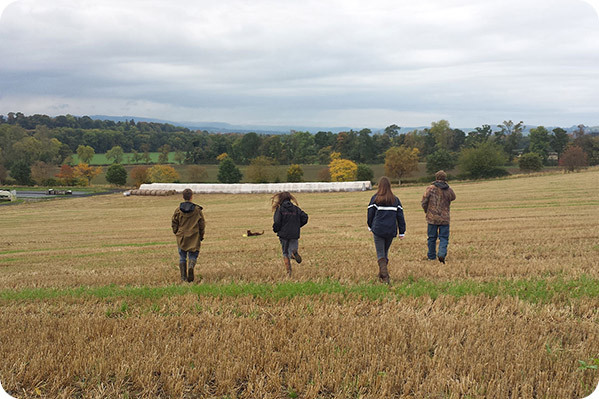 Farms with play areas that families enjoy – Cairnie Fruit farm, Active Kids, Muddy Boots and East Scryne Fruit Farm by Carnoustie – Run by my sister-in-law. Small but delicious coffee, bakes and ice cream and close to East Haven Beach so could combine a trip to the beach! Only open in summer time. If you are lucky enough to get snow, we have hills! 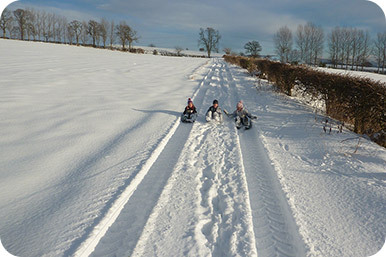 We can supply sledges on request. 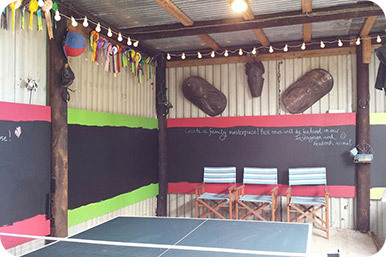 Board games or cards in front of the woodburning stove – Phuket and cards are family favourites of ours and you will find both in the Farmhouse. Walking, games or nature hunt in the woods nearby Carmichael Farmhouse – you hardly notice under the cover of trees and it costs nothing. Huntly woods are only a few minutes walk away. Racing each other at Scotkart which has also opened a laser tag area – best to book. Skatepark Dundee where you can hire scooters or boards if you do not have your own. Piperdam – large indoor area with zorbs, karting. Also has swimming pool.